Yachts Miami Beach’s Collins Avenue location has long had megayachts among its exhibits. But, since expanding to Island Gardens Marina three years ago, even bigger megayachts have been able to pull alongside the docks. This February 16 to 20, several yachts in the 150-foot and up range are on display. Here’s a preliminary list of the largest yachts to make appointments to see while you’re in town. All seven yachts mentioned will be at Island Gardens Marina. 1. Double Down. Serial superyacht owner John Rosatti acquired a 213-foot Codecasa, originally named Lady Lau, and refitted her in 2016. Double Down, the result, has an enviable upper-deck dining area that opens up to the outside. A baby grand piano nearby keeps guests entertained. 2. Skyfall. 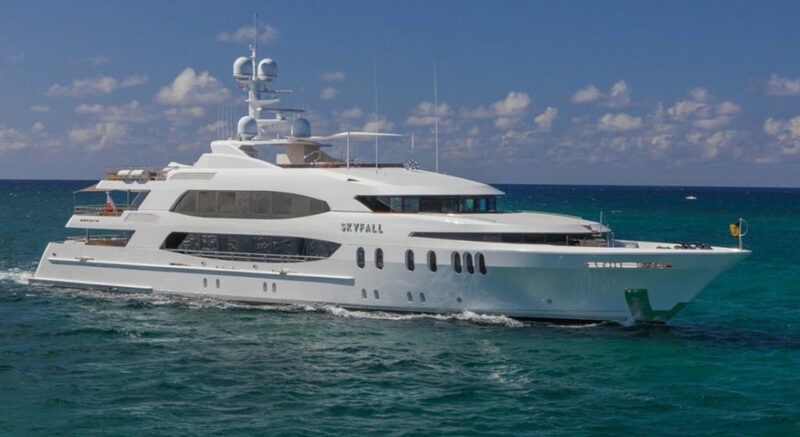 Another serial superyacht owner, John Staluppi, and his wife Jeanette didn’t change much in refitting this 191-foot Trinity (above) in 2015. Therefore, you can still see the metallic inserts in wood paneling along the stairway connecting the decks. She was delivered in 2010 as Mi Sueno. 3. Starfire. With a 1-to-1 crew-to-guest ratio, the 177-foot Starfire has plenty of toys to play on all day. She may be nearly 20 years old (delivered by Benetti in 1998), but she is well-kept. Her charter popularity attests to it. 4. Passion. Another oldie but goodie, dating from 1986, Passion is further a proven charter yacht. (Her builder, Swedeship, isn’t in yachting anymore, but does still exist.) At 173 feet, Passion has undergone regular refits to upgrade equipment, and appeal to more people. For example, she’s handicap-accessible on both the main deck and upper deck. And, the master suite and one of two VIPs are next to each other on the main deck. 5. Casino Royale. An intricately laid roulette wheel made of different stones greets you (above) as you enter the aft-deck doors of this 163-footer. Casino Royale has more than 6,900 square feet of interior space. 6. Match Point. Mahogany paneling runs throughout the 160-foot Match Point. So, too, does an elevator. Available for charter and sale, the megayacht further carries a helicopter, and has a refueling station near the helipad. 7. Argyll. When launched in 2002, Argyll earned acclaim for being the first fully wheelchair-friendly megayacht. Every deck is accessible, in fact, as is boarding from a dock. Rich woods and a Ralph Lauren interior keep the interior of this 153-footer looking classic.